Amanda Auchter is the author of The Wishing Tomb, winner of the 2013 PEN Center USA Literary Award for Poetry and the 2012 Perugia Press Book Award, and The Glass Crib, winner of the 2010 Zone 3 Press First Book Award for Poetry.Her writing has appeared in American Poetry Review, Huffington Post, Bellevue Poetry Review, Tupelo Quarterly, AGNI, Superstition Review, Poetry Daily, and the Academy of American Poets website. She lives in Houston with her husband and a lot of cats. I am determined to go to AWP next year! Thanks for the helpful tips and sharing with us your experience! 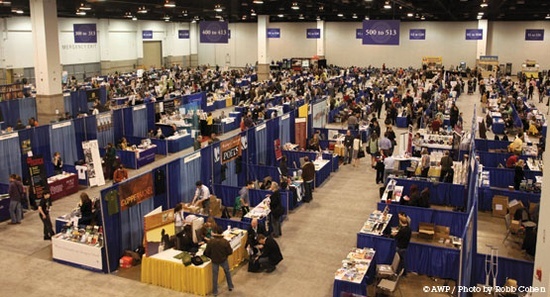 I would love to go to AWP sometime. The fact you’ve survived six is commendable! I always think of it as the Comic Con of literary wonderment. The book fair alone is worth the plane ticket and travel time to see. Thanks for sharing your thoughts! I especially loved your advice at the end, haha.